Lamont graduate student Chloe Gustafson and mountaineer Meghan Seifert installing a magnetotelluric station. 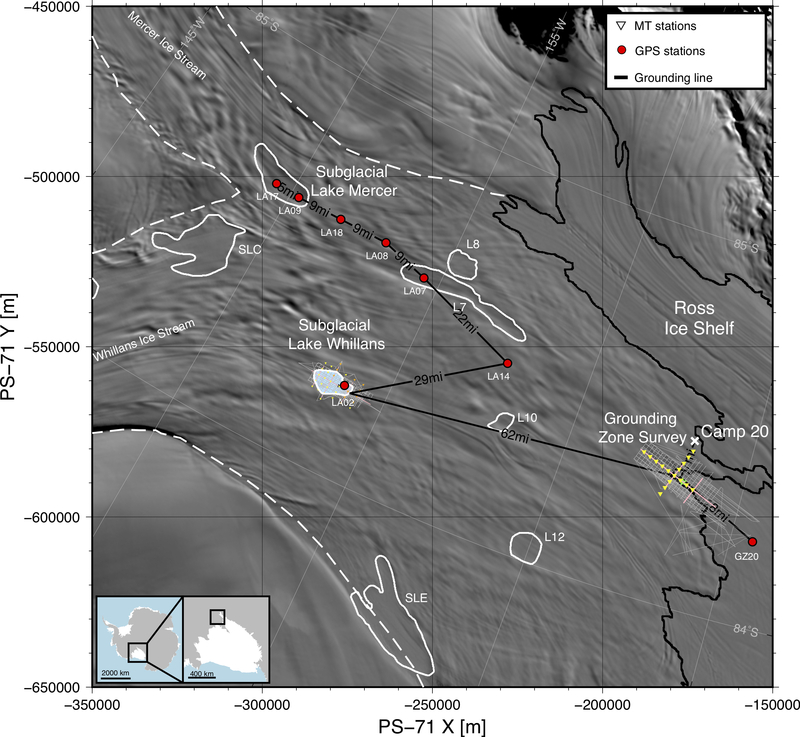 During November 2018 to January 2019 we carried out an extensive geophysical survey on the Whillans Ice Stream in West Antarctica. Our survey is the first to use magnetotelluric (MT) imaging to map subglacial groundwater water beneath an ice stream. We collected a total of 44 passive MT stations, as well as several active-source electromagnetic (EM) stations using a large loop transmitter system. 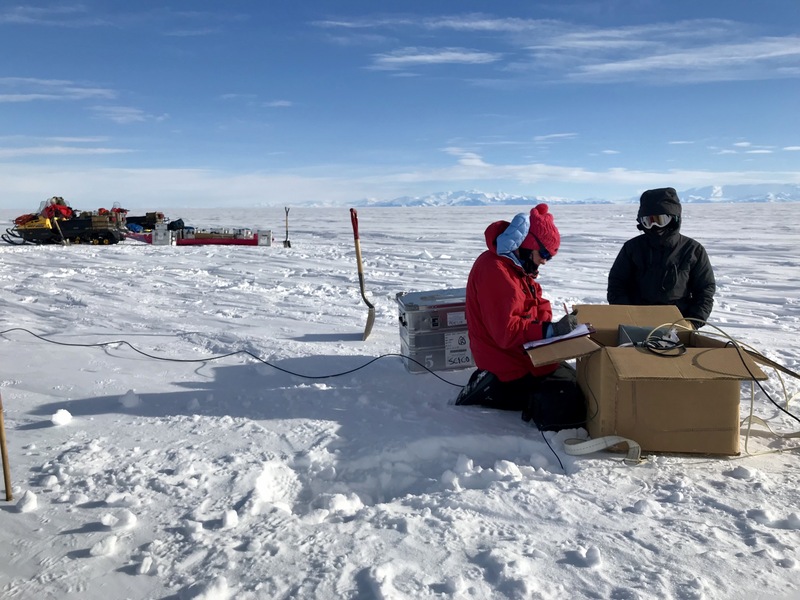 These data will be used to study the distribution of groundwater at the base of the ice stream at both the grounding line where the ice stream turns into the Ross Ice Shelf and at Subglacial Lake Whillans. We also serviced a few long term GPS stations that have been recording data for several years and that have been used to track transient changes in ice velocity associated with basal water filling and draining in subglacial lakes. 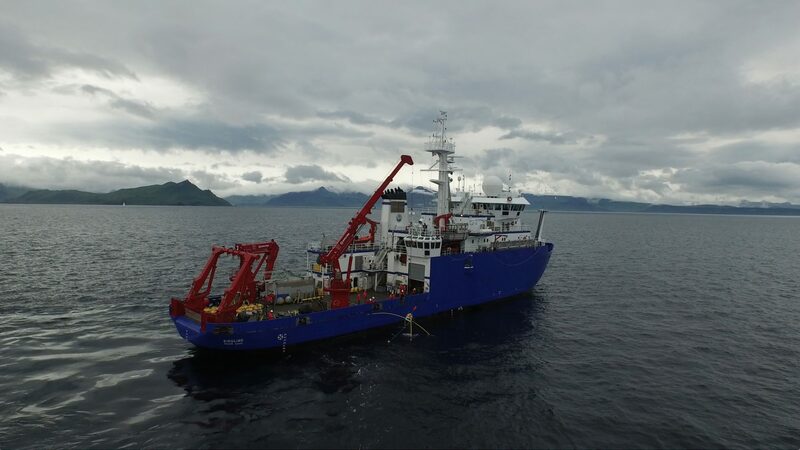 Our project is in collaboration with Matt Siegfried (Colorado School of Mines) and Helen Fricker (Scripps Institution of Oceanograpahy, UC San Diego). Both EM and MT methods and the rationale for their use are described in our feasibility study paper. Survey location on the Whiilans Ice Stream. Our four person team consisted of Columbia graduate student Chloe Gustafson, Columbia Prof. Kerry Key, Colorado School of Mines Prof. Matt Siegfried and mountaineer Meghan Seifert. We spent the first three weeks at Camp 20 while surveying the grounding zone. We then loaded up our camp gear, food, fuel and science cargo onto eight sleds that were towed by our four snow mobiles as we did a marathon drive to Subglacial Lake Whillans. There we set up a new camp and carried out a 3D MT survey of the lake and surrounding groundwater system. Finally at the end of our field season, we packed up camp once again and took a two-day drive to meet up with the Subglacial Antarctic Lakes Scientific Access (SALSA) drilling project at Subglacial Lake Mercer. After camping on our own for 6 weeks, the (comparatively) luxurious SALSA camp felt like the Ritz Carlton since we could take warm showers at last, had camp staff to cook the meals, and we could sit at proper tables and chairs when eating. Hands down this was some fun but seriously laborious and exhausting field work. Check out the photos and videos below showing scenes from our epic experience camping on the ice stream for six weeks. Many thanks to Phoenix Geophysics for lending us four MTU-5C ultra-wideband magnetotelluric systems and to Phil Wannamaker for his electric field preamp systems. We spent the first nine days at McMurdo Station taking various training courses, preparing our science, food cargo, and camp cargo. Then we waited around for several days for our LC-130 flights out to the deep field. While waiting we enjoyed some of McMurdo’s recreational activities and hikes. We also did an overnight camp on the McMurdo Ice Shelf as part of our deep-field shakedown preparations. McMurdo Station view from Observation Hill. Our first week in McMurdo consisted of lots of training classes and preparing cargo for the deep field. Matt explaining the Arctic Oven tent to be used for our kitchen and living room. Cold weather battery endurance testing of the Phoenix MTU-5C and Zonge Zen data loggers. Camp cargo ready to be shipped out. Matt and Chloe labeling rock boxes containing our frozen food. Meghan and Matt watching Chloe test if the kovaks drill works for installing a magnetometer sensor during our deep field shake down test. Mount Erebus is in the background. Kerry, Matt and Chloe and a MT station. Crevasse rescue training during the deep field shakedown. SkyTEM flew by while we were doing our deep field shakedown! Kerry on top of Observation Hill. The remains of McMurdo’s once glorious freebie golf course. Cross at the peak of Observation Hill. Weather pods that get installed out on remote trails so you can take shelter if needed. Great view of Erebus from the Ererbus Bay Overlook trail. Olivine xenoliths are common around McMurdo station. These photos show the layout of our deep field camp. The general idea is that everything should be spaced out across a line perpendicular to the predominant wind direction, and placed far enough apart to reduce drifting. Individual cargo lines have the cargo along a line parallel to the wind (i.e. streamline). We flag the cargo lines and tent routes in case things get buried or there’s a white out and we need to navigate safely from point A to B. This is the general camp layout. Premix fuel is used for the snow machines while the generators use regular gas. For our day to day work we used the smaller plastic Siglin sleds but we also had three wooden komatik sleds for hauling cargo when we traversed from one camp to the next. The snow mining pit is on the upwind side of camp and is where we dig up fresh snow for melting into water. Hence no one is allowed to walk or drive upwind of the main tent. The clean snow made really delicious water. LC-130 ski landing at Camp 20. On most days leaving stuff lying around loose like this would have been a big no-no given the strong winds, but on a calm day you could be sloppy and leave stuff lying out unsecured. Weather station sensors on a dead-man anchored tripod. The weather station’s screen remotely logged the weather data using a bluetooth connection to the sensor tripod outside. It also had a wireless connection to a portable thermometer we used to record temperatures inside our sleeping tents. Chloe preparing to install a magnetotelluric station. Meghan preparing to install a magnetotelluric station. On relatively warm day Chloe celebrates finishing installing a MT station. Meghan hooking a cable up to an induction coil magnetometer. Induction coil magnetometer oriented and leveled prior to burial. Matt and Chloe waiting for the data logger to start recording. Matt tidying up a cargo strap after the team installed a MT station on a windy day. Here you can see why we put the data logger, preamp hub and battery into a triwall cardboard box to shield them from drifting. Matt and Chloe checking the data from a magnetotelluric station. The data logger, preamp box and battery are installed inside a tri-wall cardboard box to keep them shielded from drifting snow. Although all of these components are waterproof, having to scrape off the ice every time we had to pull data and restart the logger would have been a bit of a hassle if we had instead just deployed them out in the open. Matt pulling up a buried electrode wire while we downloaded the data from the logger. In the background, Meghan gets some yoga on while awaiting us to give her the okay to pull the electrodes out. The moment right before we started our first transmissions. Matt servicing a GPS station logger and battery box while Chloe and Meghan start taking down the solar panels before me moved the box and poles to a new spot nearby. Matt connecting a cable to a GPS antenna. Skuas. These are predatory birds we saw a few times while in the deep field. Apparently they have even been seen at the South Pole. Meghan refueling while Matt works the pump. Chloe and Matt going over the station map during the morning planning meeting inside the main tent. View from the cooking area inside the main tent. Chloe under the tent floor inserting cardboard boxes to offset the deep trench formed after the ice beneath slowly melted away after two weeks at camp. Roasted brussel sprouts in the stove-top oven. Caravan moving from Camp 20 to Subglacial Lake Whillans. Kerry’s index finger after a few weeks in the deep field. Super glue ended up being a good way to stop the cracks from re-cracking every day and allowed them to finally heal. Chloe refueling while Meghan works the pump. Sleeping tents with drifting snow. SALSA camp at Subglacial Lake Mercer viewed from our flight in the Basler. MT station at Subglacial Lake Mercer that Kerry installed next to the SALSA camp while the rest of the team was servicing a nearby GPS station. This solo install only took 1.5 hours, but that was after 6 weeks of practice!